We know that kids learn at a deeper level when they do meaningful projects. We’ve seen how it increases engagement and creates memorable experiences. However, let’s be real. Project-Based Learning can feel daunting at first. How do you make it fit within the standards? How do find the time for it? How do you make sure every student participates? 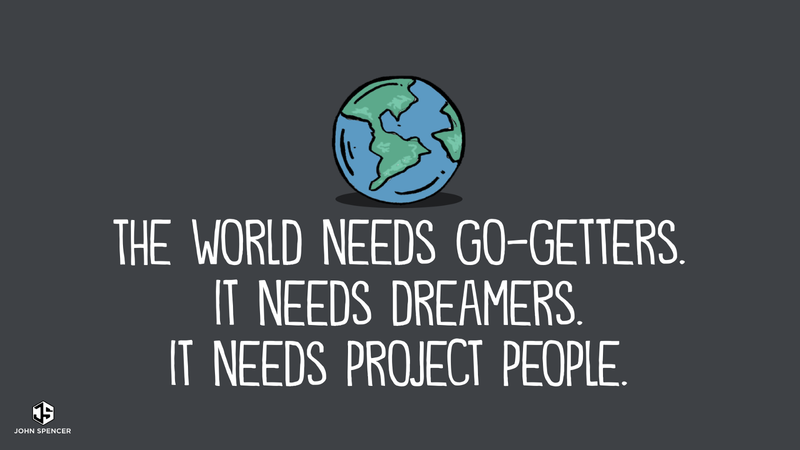 If you’re curious about PBL but you’re also terrified to make the jump, I totally get it. I’ve been there before. In fact, I believed in seven different lies that prevented me from trying out PBL with my students. In this blog post, I share the story of my most epic teacher ever and my own journey toward using PBL. Finally, I explore the lies that create the mental blocks that keep teachers away from implementing PBL. But first, I want to share a story from when I was a student. 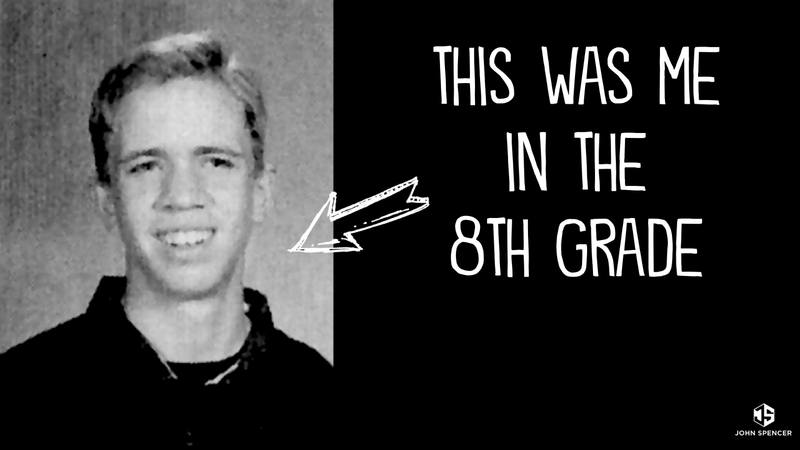 This is me in the 8th grade. I was a combination of shy and nerdy. My whole goal was to remain invisible. I had one friend, this kid named Matt. We were two nerds in a pod. And, fortunately for me, he had perfect attendance year after year. Until, one day he was sick. I stood in the cafeteria, looking out at the sea of students, hoping someone would invite me over. But it didn’t happen. I hid in boy’s restroom for the next 24 minutes. But not to Mrs. Smoot and Mr. Darrow. They knew me. They knew I cared about social justice and baseball and history, so they invited me to do a History Day project. Although it was fun, it was also terrifying. I had to plan the entire project and track my own progress. I had to figure out what questions to ask and where to find the answers. I had to narrow down my topic to something I cared about — in this case, Jackie Robinson and the integration of baseball. I wrote letters to newscasters and made phone calls to former players. I remember picking up the phone, my hands trembling, as I read aloud my pre-recorded script and waited for the stranger to respond. I eventually worked on a slide presentation. The most nerve-wracking moment occurred when I sat in a radio studio recording my script. When I listened to my voice for the first time, I hated it. At one point, I threw my hands up in the air. “I’m not doing this,” I said. But she said something that stuck with me forever. I ended up sharing it with my class and then in the district competition, state competition and eventually in Washington D.C. That project helped me grow into a creative thinker and problem-solver. And that experience is why I ultimately embraced project-based learning. Although I didn’t realize it at the time, I had just experienced project-based learning. Mrs. Smoot and Mr. Darrow were the reasons I became a teacher. I never forgot that epic experience. And I knew that I was more engaged and learned at a deeper when I learned through a project. However, it took me awhile to embrace a PBL approach. Don’t get me wrong. My students completed projects. However, they were always culminating projects. I chose the end product and reverse engineered it for them with detailed step-by-step instructions. I set tight parameters so they would know exactly what to do. In other words, these weren’t projects. They were recipes. I was doing all the work. Often, on my ride home from work, I would daydream about doing a PBL unit. But I was afraid. What if the students misbehaved? What if they didn’t do their work? What if the groups just talked to each other about football instead of actually collaborating? What would my principal think? How would I possibly connect it to the standards? So, I tucked it away in the “someday” category and continued to teach in a teacher-centered model. But this changed on a lame duck testing week toward the end of my second year of teaching. I had a challenging group of students that included several who were sent to the team leader (me) when they couldn’t behave in their original class. I knew I had to create something engaging for them when they finished testing or else the week would become a nightmare. But I also knew that this was a hidden opportunity. I had a free do-over card I could play if the project tanked. After a short class discussion, we landed on a documentary project about immigration. Students formed small groups and began researching the topic. What happened next was a mess. I gave mini-lessons on how to conduct interviews, how to shoot video, and how to tell a non-fiction story. I met with students one-on-one to go over how to find more credible sources. We shared scripts back and forth on a shared document. But things didn’t go smoothly. A few students didn’t finish their parts. We never launched it to a real audience. Some of my highest performing students were more frustrated and more afraid than ever before. They had never failed like this. Still, something emerged from the mess. Students who had never turned in homework before began voluntarily shooting videos of interviews with immigrants in their neighborhoods. Students who had never asked questions in class were asking hard-hitting interview questions. Students who had once told me, “I’m not very creative” were setting up storyboards and editing videos. What began as a short, one-week project grew into something bigger, with students coming in before and after school to add to their project. They were making history — literally, by recording interviews, adding their own scripts, finding visuals, and then working collaboratively with other teams to create one larger documentary. This wasn’t a recipe. Each student had created something truly unique. The short answer was fear. I was terrified of losing control, of having chaos in the classroom, and being judged as a trouble-maker by my principal. I was worried about the lack of time and resources. But that tiny little project had changed me as well and I knew I wanted to empower my students through project-based learning. From there, I had students work on a blogging project and later a service project that combined design thinking and service learning. We started painting murals and later doing STEM projects. A quick confession: it wasn’t perfect. I had projects that totally tanked. I had times when I provided too much structure and then times when I didn’t give enough scaffolding. Even on the best days with our best projects, I had moments when kids checked out and I became that awful nagging teacher. But despite all the bumps in the road, it was worth because of what happens to students who create epic projects. When I look back at my own PBL journey, I realize that the biggest barriers I faced in implementation had less to do with external structures and more to do with my own failure of imagination. I believed in certain lies that kept me from truly embracing a PBL approach. Lie #1: There’s no time for it. Projects take time and, for that reason, it can feel like you are adding a new thing onto an already crowded plate. But what if it’s not about adding to a plate so much as reorganizing a plate? Once I began implementing PBL, I started to scrap tests and quizzes. I reduced the amount of direct instruction. I layered standards so that students could learn multiple standards at the same time. The result was something that felt slower but was actually more efficient. Lie #2: The curriculum map is too tight to allow this. The curriculum map is crowded with tons of standards and that doesn’t seem to square with the need for authentic PBL. But I’ve learned that these limitations are often the creative constraint that lead to breakthroughs. Every barrier is a chance to innovate. It’s easy to view the curriculum map as a tight set of directions telling you exactly where to go. But what if it’s more like a general map showing you destinations you need to reach but you can actually find the route on your own? 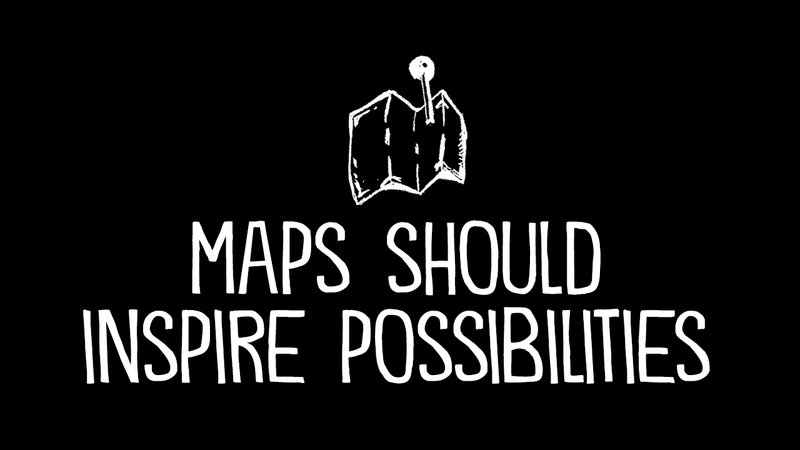 In other words, what if it’s less like Google Maps and more like a treasure map? Early on in my PBL journey, I started doing an audit of the standards with a few questions: Where is the wiggle room? What freedom do we actually have? How can this connect to authentic design experiences? Eventually, I realized that certain standards fit well within certain approaches to PBL: inquiry-oriented, choice-oriented, design-oriented, problem-oriented. In a few weeks, I’ll be exploring this topic more in-depth. But the idea is this: I was able to align our projects to our curriculum map. Lie #3: It will get chaotic and crazy. I often here people describe the need for “controlled chaos” when doing PBL. One teacher said, “you have to be comfortable with a lot of noise and movement.” Unfortunately, I’m an introvert. I need spaces of quiet and chances are, my students need the same thing as well. I learned, over a decade of using PBL, that it’s okay to have procedures and expectations. 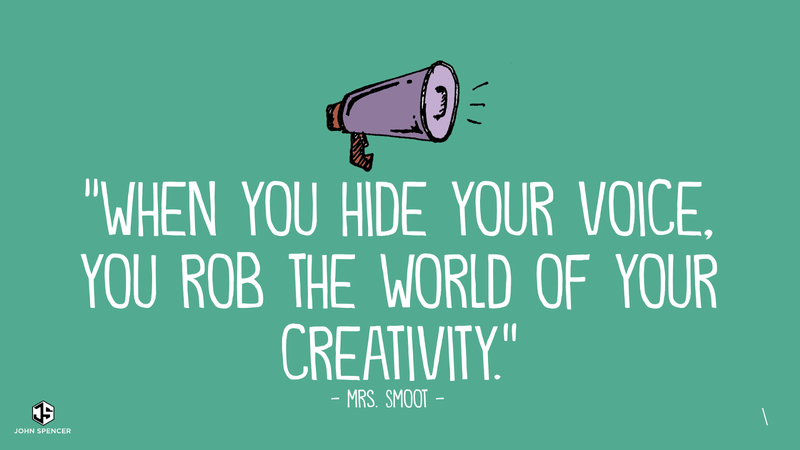 I needed to find ways for introverted students to thrive in collaborative projects. I realized that I needed to create ways toguarantee that every student participated in creative collaboration. In other words, you can have a well-managed classroom and still do PBL. Lie #4: Kids won’t pass the test. The research on this is scarce, because it’s really hard to prove that a PBL framework can increase student achievement. However, I worked in a high-stakes environment and my students were always toward the top on our state tests. I’m totally sympathetic to the teachers on this one. I hate the test. I hate the pressure that comes with testing. I hate the fact that teachers are being judged by such unreliable metrics. I never completely got over the fear and the stress around testing and the nagging question of whether PBL would mean our scores might plummet. But I can say that they always remained high because a project-based framework led to higher engagement and more student buy-in. Lie #5: PBL means you don’t need any structure. Project-based learning doesn’t mean you have to slip into a total free-for-all. The goal is to have structures in place that inspire and facilitate creativity. These include structures for inquiry, for research, for ideation, for revision, for peer feedback, for self-assessment, for project management, and for metacognition. The best structures inspire rather than limit, the creative process. These are all some ideas I’ll be exploring in an upcoming PBL Master Course I’ll be releasing in a few weeks. Lie #6: You need the best high-tech gadgets to pull it off. It’s true that some of the best projects involve a studio or a 3D printer. But some of the coolest projects are also built with duct tape and cardboard. My friend Trevor is one of the best PBL teachers I know and his students did an amazing World War II documentary using their smart phones. The picture quality wasn’t perfect but that didn’t matter. The real power was in the storytelling and the deeply human connection of having seemingly jaded high school students interviewing former World War II soldiers. I never had a fancy studio or the most high-tech makerspace but I learned pretty quickly that the most powerful part of PBL is student agency and creativity. Voice and Choice will always beat out a 3D printer. Always. Lie #7: You need to wait for permission. I’m not someone who believes it’s better to ask forgiveness than permission. I actually think teachers should share the PBL process with their leaders and explain how it leads to deeper learning and better skills. It helps to share how the projects align to the standards. But sometimes teachers will wait for permission. They’ll wait for that principal to come along and say, “We’re going to try PBL as a school.” I spent my first few years believing this lie. I was waiting for permission or encouragement or that “perfect time” when I really just needed to take the leap and make it happen. 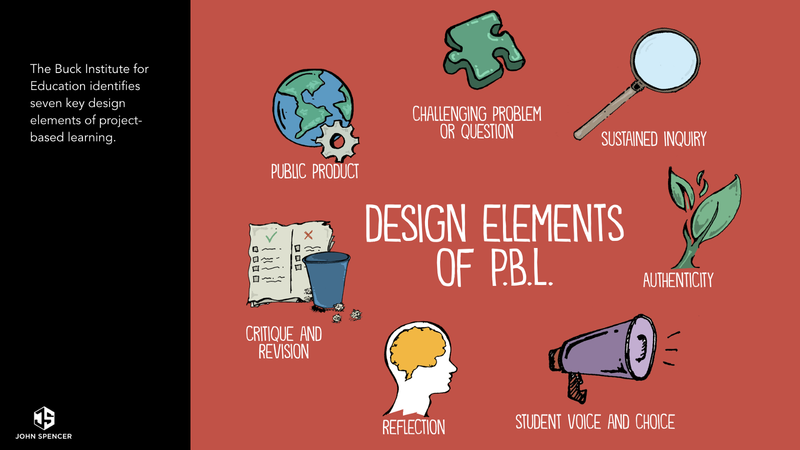 You might be thinking of using taking the PBL leap but you’re not quite sure where to start. For that reason, I’ve distilled everything I learned about PBL into a practical PBL Toolbox. This toolbox includes a set of projects and mini-projects, along with a Getting Started with PBL guide and a set of assessment resources you can use within the project-based learning framework. I will also send you a weekly email with free, members-only access to my latest blog posts, videos, podcasts and resources to help you boost creativity and spark innovation in your classroom. You can access the toolbox here. My goal is simple. I want to make something new every day. Some days, I make stuff. Other days, I make a difference. On a good day, I get to do both.